We fished the last two days on the same inland pond that I scouted out Friday afternoon. We had some great success fishing for bluegill but failed miserably when trying for perch. Saturday morning we met up on the ice just after 6am. We cut holes across a deep bowl and worked through them. Then cut more holes and worked through those as well. Over and over we came up empty handed. So we called it quits around 8am and headed to the shallows for bluegill and pumpkinseed. The perch reports we have heard this year have been pathetic. When we got on the first weed bed, we cut out some old holes from the day before and punched quite a few more to accommodate all of us. The weeds grew very tall here. At the top they were slimy but if you punched through it they were nice and green… Great fish habitat! We caught decent sized fish in a large area for a few hours then decided to move to the second spot I found on my scouting mission to see if there were more and bigger fish. When we got over there it didn’t take long to get on the fish! The size of the fish were better but the numbers were slightly lower. We fished around and around until the fish were harder to come by. It was mid day at this point and the weeds in this spot were very short so the fish had no where to hide for when they went inactive. When we realized the fish had moved to better weeds for a nap we packed up and headed back to where we started. The rest of the day went very well. We caught lots of fish and it picked up big time right before dark. I have no idea how many fish I caught but it was pretty consistent all day. We landed lots of bass and pickerel as by catch. I didn’t get on the ice today until around noon but Bobby and one of our buddies had been doing fairly well since the sun came up. They checked both spots we fished the day before but only found good numbers on one. Until about 4pm, we hole hopped to stay on the fish finding that they were going back and forth. We were catching some really nice fish. 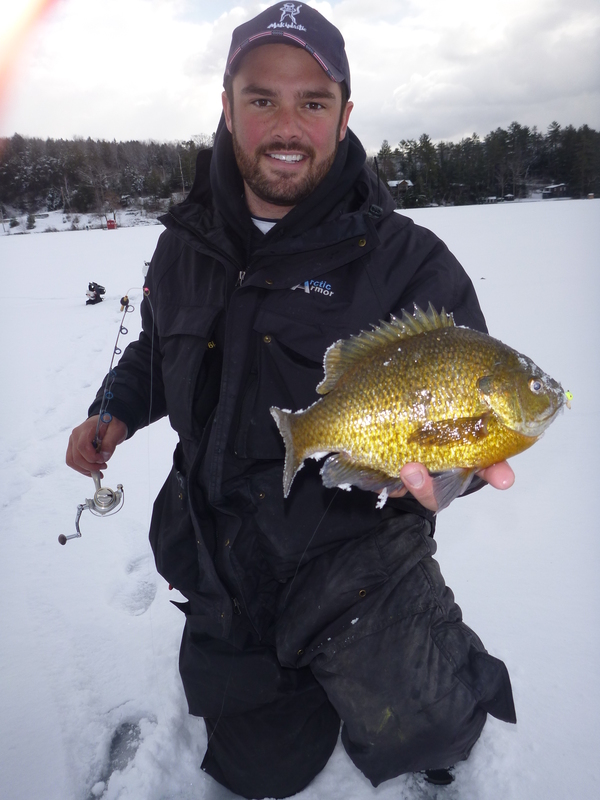 I had one hole that I sat on for quite a while because I was catching my favorite fish… Pumpkinseed! Right before dark the fish really started pounding. 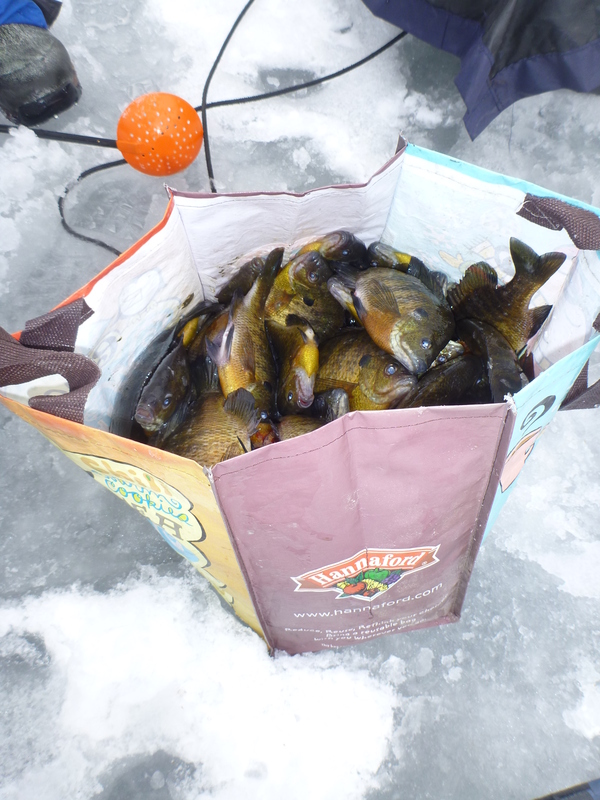 We caught them at every depth from 6″ below the ice down to the bottom. It was truly the magic hour up until 5:50pm. A good day on the ice went out with a bang! The plan is to head out tomorrow on Lake Champlain. The weather looks good up until around noon so it may be an early day. Either way, we will catch at least a few fish and that’s good enough for us! A good mid day gill! Hard to believe you had problems finding perch, but then again I haven’t caught any gills this winter. The perch in this specif lake roam a large bowl constantly. They are harder to find but when you get on them you can pull your limit quick. The best strategy is to go often or have reports form people who do. This year no one is fishing the perch much… Seems to be an off year for them!